Chromium (Cr) pollution is an emerging environmental problem. The present study was carried out to isolate Cr-resistant bacteria and characterize their Cr detoxification and resistance ability. Bacteria screened by exposure to chromate (Cr6+) were isolated from Mandovi estuary Goa, India. Two isolates expressed high resistance to Cr6+ (MIC ≥ 300 µg mL−1), Cr3+ (MIC ≥ 900 µg mL−1), other toxic heavy metals and displayed a pattern of resistance to cephalosporins and ß-lactams. Biochemical and 16 S rRNA gene sequence analysis indicated that both isolates tested belonged to the Staphylococcus genus and were closely related to S. saprophyticus and S. arlettae. Designated as strains NIOER176 and NIOER324, batch experiments demonstrated that both removed 100% of 20 and 50 µg mL−1 Cr6+ within 4 and 10 days, respectively. The rate of reduction in both peaked at 0.260 µg mL−1 h−1. ATP-binding cassette (ABC) transporter gene involved in transport of a variety of substrates including efflux of toxicants was present in strain NIOER176. Through SDS-PAGE analysis, whole-cell proteins extracted from both strains indicated chromium-induced specific induction and up-regulation of 24 and 40 kDa proteins. 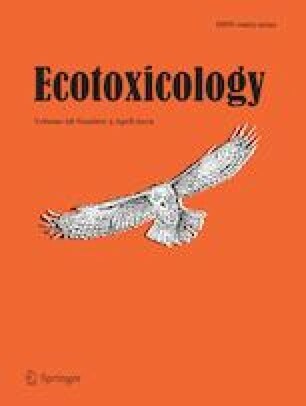 Since bacterial ability to ameliorate Cr6+ is of practical significance, these findings demonstrate strong potential of some estuarine bacteria to detoxify Cr6+ even when its concentrations far exceed the concentrations reported from many hazardous effluents and chromium contaminated natural habitats. Such potential of salt tolerant bacteria would help in Cr6+ bioremediation efforts. The online version of this article ( https://doi.org/10.1007/s10646-019-02038-w) contains supplementary material, which is available to authorized users. We thank the Director, CSIR-NIO for support and facilities to carry out this study. The authors acknowledge the funding support from CSIR project PSC0206. The first author acknowledges research fellowship by the University Grant Commission (UGC) (Sanction letter No: 18-12/2011(ii) EU-V). This is NIO’s contribution No.